I don't have too much to chat about, but I wanted to start off the week with an idea I had. I do write knitting patterns, and some of you out there are making the toys. So why not showcase your toys here? I thought if I posted photos of some of my favourites, it might make you feel good to be famous, and encourage others to knit their own toys. Okay, I admit that appearing on my blog won't make you famous, but maybe it will make your day a little better :) I will be selecting the photos from my Flickr pool (see the link there on the right) so add your photos if you want to be included! 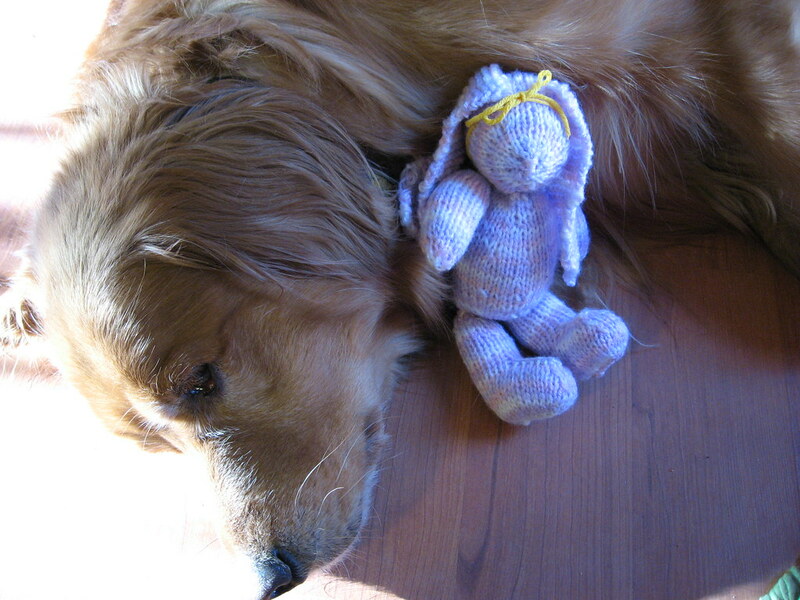 To start things off, here's a bunny my friend Eunice made from the Bunny with Hoodie pattern (I haven't asked if I can use her photo, but as she's my friend, I'm betting she won't mind) This bunny seems very fond of animals of all kinds :) I like the look of the variegated yarn. Posted by Barbara Prime at 11:17 a.m.
What a lovely idea. I bet there will be a wonderful collection. Look forward to seeing them. April 9, 2008 at 6:19 a.m. Wonderful idea and I love the photo. Will be watching for those who've worked up your patterns. April 9, 2008 at 11:54 a.m.